Defensive Rotation will make your players more familiar with each position and keep them engaged. Rotating players during the inning on defense is a great way to keep them engaged. 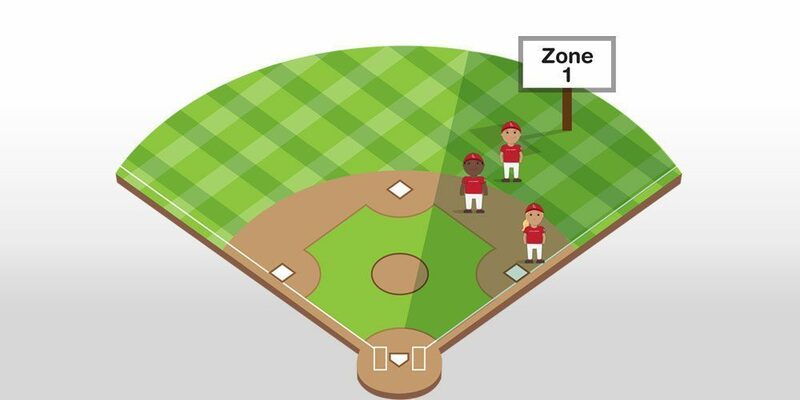 An effective way to do this is to divide the playing field into 2 or 3 zones, assigning a coach to each zone, and rotating players within each zone after every batter (or after a predetermined number of batters). The following sample defensive rotation divides the field into 3 zones and ensures that every player gets to play an infield and outfield position every inning. After Each Batter: 1st base moves to 2nd base, 2nd base moves to right field, right field moves to 1st base. After Each Batter: Pitcher moves to Left-Center Field, Left-Center Field moves to Right-Center Field, Right-Center Field moves to Pitcher. After Each Batter: Short Stop moves to 3rd Base, 3rd Base moves to Left Field, Left Field moves to Short Stop. If you use a catcher, it is recommended that the catcher stay in position for the entire inning due to the need to wear catcher’s equipment. Make sure to assign a coach to each zone. Once players have rotated, have them get in a ready position for each batter. Utilizing coaches on defense is a great way to keep players engaged in the field. The defensive team’s coaches should divide the field into zones and work with players in their area to stay alert and engaged. Utilizing tactics such as having players get into a ready position, having players call out where they will throw the ball if hit to them, etc. keeps players active and focused. Coaches can also consider taking an extra ball or two onto the field with them to toss to players to keep them engaged during times when the ball is not hit in their direction. For additional drills and practice sequences, view the Little League® Tee Ball Program. Additional copies of the Tee Ball Curriculum are available for purchase on LittleLeagueStore.net.